"The first river ferry I took was an exciting, magical experience and I couldn�t stop grinning. The 4000th river ferry I took was tedious and I was no longer thrilled by the experience. The geography of this region of Vietnam doesn�t lend itself for huge stretches of riding. Multiple times a day we�d find ourselves reaching the end of the road, faced with a 30 minute wait for a river ferry to turn up and transport us across the water. At first a novelty, this soon became tiresome � especially on our final day, when we had a 12-hour ride ahead of us. When we just had a short day of riding, however? The river crossings were a fun way to see what the locals were carrying, to take a rest and stretch our legs, and to take some photos now that we finally had our hands free". De Mekong Delta - is also called the 'rice bowl' of Vietnam. The Delta has a dizzying variety of green colors. It's a water world, which moves to the rhythm of the mighty Mekong River, where boats, houses and markets are floating on numerous rivers. Rivers and canals crisscross the landscape like arteries. The lively trade of the city contrasts sharply with the languid, almost soporific pace of life in rural areas. Buffaloes are working here on the rice fields. With coconut and fruit-laden boats float slowly through the muddy brown water. And if you're here to cycle along the narrow roads, you will be amply rewarded with the true flavor of rural hospitality (and delicious river fish). Elsewhere in the Mekong Delta, you find mangrove forests teeming with birds and remnants of Vietcong Tunnels. Ornate Khmer pagodas and Buddhist temples reaching to the heavens, while the islands off the coast have white sand beaches. Tropical spots for tourists, for others pirates a hideout. The Mekong flows through six countries and has a length of 4500km. The river flows through China, Myanmar, Laos, Thailand and Cambodia. In Vietnam, the river receives many tributaries: the Delta. All these rivers and streams make their way to the South China Sea. 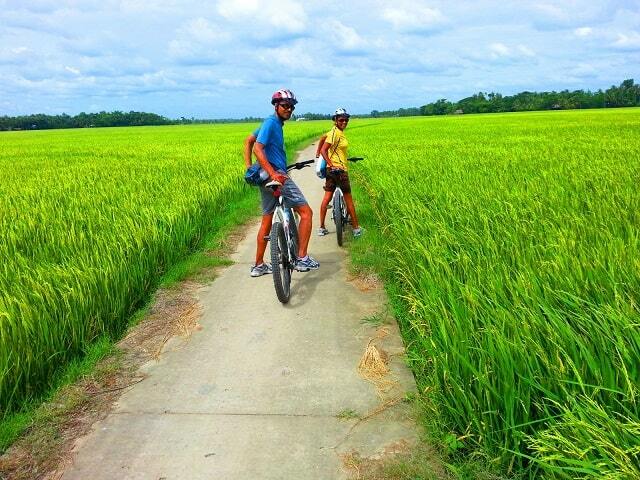 The Mekong Delta is very flat and fertile area, so you can make beautiful bicycle tours here. The major part of the delta consists of rice fields. 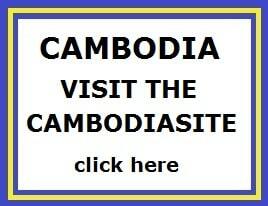 You have several beautiful villages there, vast rice fields and beautiful floating day markets. Visit a floating market, you may not be missed. All these beautiful sights in the Delta are very popular and it's a tourist attraction in Vietnam. 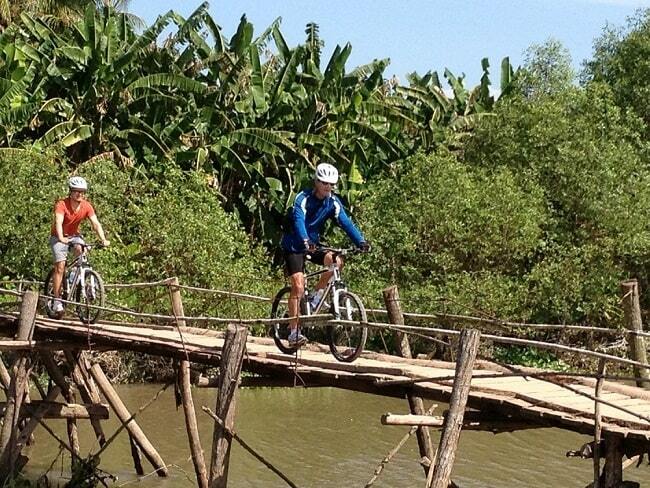 In Ho Chi Minh City, there are several travel agencies that organize cycling tours in the Delta. A bicycle (of course) is preferable, but you can also book a bike in Ho Chi Minh City. With a reliable tour operator, possibly accompanied by an English speaking guide and luggage transport, you'll have a wonderful vacation. The best time for cycling in tje Mekong Delta is after the rainy season. It the rains from May through to November. In the month of December is the rainy season in southern Vietnam over and the temperature is pleasant. Actually it is in the south of Vietnam's warm all year round which makes it a very pleasant area to visit. The best time for South Vietnam from December to April. It's very relaxing cycling along slow flowing rivers through the rice fields of Vietnam. Your trip takes you across numerous wooden bridges and dikes. Occasionally you have to cross a river by ferry and pass islands with tropical foliage. You'll ride further and passes sugarcane plantations, coconut plantations, picturesque villages, floating markets, bright green rice fields, temples and you'll enjoy the unspoilt countryside. Cycling in the Mekong Delta also means getting to know the local culture. 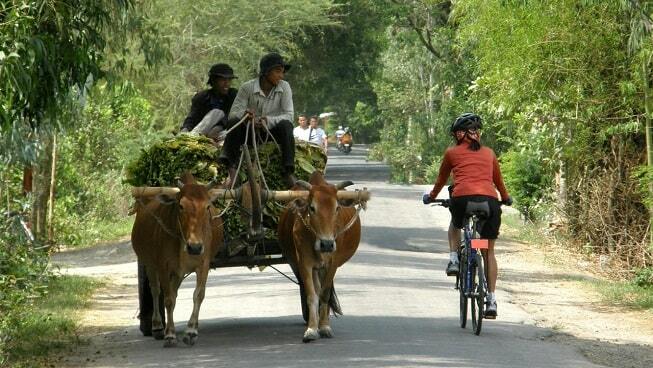 During your cycling tour you can see the Vietnamese people, who are hard at work. The locals are always up for a chat with the tourists. Cute Vietnamese children walking to school, features a cheerful backpack with cartoon characters on them. A stay at people's homes, a homestay is the Mekong quite suitable. The people are very friendly and welcoming, so you will be welcomed as an old friend. A perfect 'stop' when you ride in Mekong Delta, is a boat ride. Bobbing on the water in a boat and you can totally relax. You can combine your cycling tour in the Mekong Delta with a boat trip. With a boat, it is possible to penetrate deeper into the rivers of the delta. During such a boat you sail along the Vietnamese countryside. It is a rural area, yet densely populated. It is a fertile area. Along the river there are many rice fields, orchards and other types of agriculture. The river is the largest source of income for the locals.